Reiki Crystals Grid is a device which is used to magnify the healing energy. It was made popular by William Lee Rand. The beautiful thing about the grid is that it’s a double whammy where we are using Crystals and Reiki together. Crystals have their own healing properties and when combined with Reiki they work much more beautifully giving results faster. 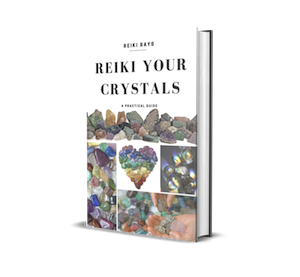 It is said that each crystal which is present on a grid is equivalent to a second or third degree practitioner and Reiki is continuously flowing through them for 24 hours, so imagine how powerful a grid can be! Reiki works and flows through intention, which can be conscious or unconscious. Most commonly used crystals are Clear Quartz but one may even use Amethyst. Pink Quartz too is very popular when one is giving healing for love and relationships. I have used all possible crystals on my Grid, starting from Clear quartz to Citrine to Lapis Lazuli and they all have given me wonderful results. Use your intuition regarding which crystals do you want to place on your grid. The Quartz crystals have the unique property of absorbing and hold the intention. Infuse them with Reiki and your intention. A grid is generally taught in the third degree, for those who have not learnt it, I am breaking the steps to set up a Reiki crystals grid for everyone’s benefit. The grid is hexagon shaped, and you need 6 crystals, since I did not have pencil shaped crystals I used crystal pebbles and they worked as great as a pencil shaped one! We also need a crystal pyramid to be placed in the center and a crystal wand to charge it. The wand is a jumbo crystal which has to have a point. Any wand will do except metal. 1. Soak the crystals in rock salt water for 24-48 hours. Wash them in running cold water. Do not touch the crystals when soaking; trust me when I say do not touch as all the impurities from the crystals get absorbed in the salt water and touching them can make you fall sick, I have learnt it the hard way, you should not! Please remember not to soak the crystals in any metal container as the chemical properties of the crystal can get altered. 2. Once the crystals are washed take them out on a paper or a cloth towel and dry them. Bless the crystals with any prayer or by giving Reiki to them for 2-3 minutes each. 3. Charge the crystals by attuning them i.e. draw all the symbols over each crystal with the intention that they manifest for the highest and greatest good. 4. Place photos of people or intention slips anywhere in the grid. The grid will continuously keep sending Reiki to all your intentions. Make pie shaped movements as mentioned in the diagram above. thank u for the free book download….being presently unemployed @ 70 i find u to be a special angel to present this fabulous info for free…..!!!!!! i admire u left ur job and have built ur life into a professional spiritual profession !!! i studied w/Doreen Virtue in Hawaii and received my Angel cd certificate….i had a lovely Reiki biz from my home….then i had a health challenge w/lung cancer …it`s all good i am cancer free have been assisting seniors for income and since my last client has passed…i am concentrating on Spiritual side and studying with a Psychic Medium Richard Schoeller …..
my original comment was going to be regarding crystals …where i can get them at a decent price? got carried away …it is just so wonderful to communicate w/a special Reiki person like urself…..
okay have a blessed day……many blessings !!!! <3"
I agree, as I understand it. Salt is very abrasive to crystals and have stopped using it to cleanse my stones. Water bless by the full moon is good to put crystals in for cleansing. I always use reiki too. 🙂 L. R.
While charging the crystal, should it be in an anticlockwise direction as indicated in the diagram and what is the reason for it? Could it be charged in a clockwise direction? your angel courses please send me details on my email id. thanks!!!!!!!!!! Can we use “Antakahkarana” symbol under the grid ? love all the info. enhances my Reiki tons. best reiki site ever. Really this is a very usefull information. It will add to the power of healing . Thanks a lot for the valluable knowledge. Thank you so much for the grid article. I have been using crystals in my reiki work but not as a grid. I will introduce it. I charge my crystals each full moon. I also charge a jug of water with full moon energies and use that to recharge crystals between full moons. can we use one master crystal for charging many grids…..say 2-3 or more.